This guide is intended to help you set your school up on Times Tables Rock Stars. To find out how the programme will work, please visit How It Works. Follow these steps if you have received an email inviting you to become a Manager of your school's TT Rock Star account. It will ask you to set a password for the first time. You only need to do this once. It will then take you to a sign-in page - enter your email address and new password. You will be offered 10 randomly generated rock names. If you see one you like, click on it. This will now become your rock name and it cannot be changed. Pupils will also have to choose their rock name the first time they log in - to avoid disappointment, it may be worth making it clear to them that the rock name cannot be changed once selected. You'll now get the chance to design your avatar. Once you click on the Save Avatar button it will take you to the Dashboard where you can begin playing or setting up classes (Bands) and pupils. Adding more teachers (Managers) is simple. Go to My School > Teacher Accounts and click on the 'Add A Manager' button and fill in the required details. A short email will be sent to their email address with a link for them to click on. That's all there is to it. 'Bands' are groups of players, i.e. usually your school classes or intervention groups. TTRS allows pupils to belong to two Bands at the same time, which we have called Maths Bands and Pastoral Bands. The Maths Band is the group that learners are in for their maths lessons and Pastoral Bands are for their form/tutor/registration group. In scenarios where pupils are taught maths in their form class, you may not need the Pastoral Bands feature at all. You may like to use Pastoral Bands to bundle all students from a yeargroup or school house into a single group or use them for competition purposes, lunchtime clubs or nurture groups. 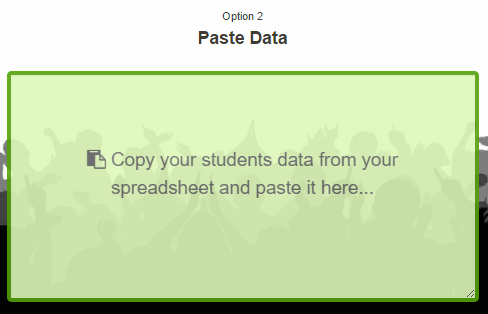 You can create classes and user accounts for pupils very quickly by uploading a spreadsheet. You can upload every class in the school at once and it will create the classes *and* the pupil accounts at the same time (there's no need to create the Bands first). This may sound terrifying but don't worry, if the instructions and video can't help, just email or call us and we'll do it or guide you through the process. The quickest way to prepare a 4-column spreadsheet with the pupils’ first name, surname, class and yeargroup. Save time by including several classes in one long list. If you want, you can include extra columns such as DOB, gender, form group, username and password. Hint: As usernames for the pupils, many teachers use the pupils' school log-ins or their MyMaths/Mathletics/MangaHigh/etc log-ins. Copy the data in the spreadsheet by selecting the cells from the top left to the bottom right and pressing ctrl & c (Windows) or cmd & c (Mac). Make sure you’ve included the top row (column headings) too. Login to the website and go to My School > Pupil Setup > Upload Users. Tap in the large rectangle on the right so that the cursor appears and then paste by pressing ctrl & v (Windows) or cmd & v (Mac). This will go smoothly so long as your spreadsheet is in good order. All being well, that should have done it! You’ll be told they’ve uploaded successfully and be given the chance to save the username labels. Over the years, we have accumulated billions of times tables answers from children around the world. From that data, we've formed a sophisticated understanding of how pupils internalise each multiplication and division fact and how they begin to understand the underlying concepts. We then deconstructed all the tables up to, and including, the 12s and reassembled them several times, until we created a highly effective sequence to learning the answers. With Automatic Training Mode (ATM) enabled, your learners will go through our pre-programmed levels when they play in the Garage or Arena. As well as saving you time, ATM will shorten the time it takes for your learner to become a Rock Star! To get started, please go to My School > Pupil Setup > Set the Tables, then click 'enable Automatic Training Mode'. Note: This currently starts everyone at the very beginning, so is most suitable for times tables novices. As Band Manager (teacher), you can set up a 20-week practice schedule for your pupils with just a few clicks. Note: Whatever you set will only restrict the times tables in the Garage and Arena games. Teacher accounts are not affected by any tables you set. Each week, the tables run from Sunday 00:00 to Saturday 23:59 GMT. To get started, please go to My School > Pupil Setup > Set the Tables. We've tried out lots of different orders over the years and have two key pieces of advice. Make it easy to start with. The temptation, even with younger yeargroups is to give them the 2s, 5s and 10s altogether. Bear in mind that each table is made up of 48 facts, not 12, so by selecting just three of the tables, you're actually putting nearly 150 facts in front of the pupils. Get them off to an easy start so that they fall in love with TTRS and build up the confidence they're going to need when it gets harder. Give them just one of the tables (see next piece of advice) and make it an easy one. Related to the previous piece of advice, choose one table per week and then every third or fourth week give them a combo week. The most successful TTRS teachers combine the tables slowly, like in the example schedules below. Within each Band (class) you can further group the pupils and set each mini-group a separate schedule of tables to practice. To do this, go to My School > Pupil Setup > Set the Tables. From there it's just a case of dragging pupils into one of the 5 groups and setting a schedule for each one you've used. There are four game types that differ according to which times tables the questions come from and whether it's a single- or multi-player game. There are slightly different reasons why you, as the teacher, might get pupils playing on a particular game type - it depends on the pupils (st)age, whether it's the first time they're playing, and whether they're playing to improve or to compete. Times-tables: restricted to those set in the Schedule (see below for how to do this) by the Band Manager. Roughly 1 in 4 questions are division. As the teacher, you can control which questions they get in the Garage so it's more appropriate for younger primary school children to play in the Garage, particularly as they start out with the 2s, 5s and 10s. It's free from the distractions of competing against other pupils and as an extra incentive, pupils get 10 coins per correct answer instead of 1. The focus, however, should be on competing against yourself. The TT Rock Star engine works out your mean score over the last 10 games in the Studio and it's your speed in the Studio that determines your rock status. The more questions on average that you answer correctly in a minute, the higher your status. Starting off as a Busker you get to Rock Star if your per question average is 3 seconds, Rock Legend if it's under 2 seconds or Rock Hero if your average speed is 1 second or less per question. Times-tables: restricted to those set in the Schedule (see below for how to do this) by the Band Manager. Roughly 1 in 5 questions are division. Reasons to play in the Arena: The Arena, like the Garage, is only for practising the times tables that you - the teacher - have set. The difference is that it's a multiplayer game for pupils to perform with other bandmates! Pupils join a game at the same time and compete to see who can answer the most questions.